Kapiolani Park: a Place to Relax on the Edge of Waikiki. 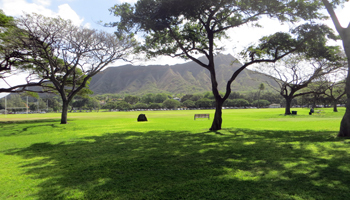 Kapiolani Park: A Place to Relax on the Edge of Waikiki! 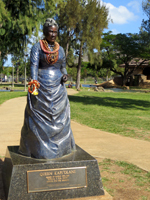 Located on what was originally an arid plain and adjacent swamp, the land that would become Kapiolani Park was dedicated by King David Kalakaua in 1877 as the very first Hawaiian public space, and it was named after his wife, Queen Esther Kapiolani. Initially it was to be privately developed and managed as an exclusive center for horse racing; but at the insistence of the king, public areas were added. In 1904, the predecessor of today’s Waikiki Aquarium was built on the site. 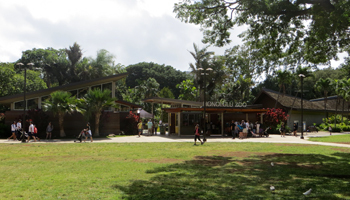 In 1915, the Honolulu Zoo was constructed within the complex. In 1927, the Waikiki War Memorial Natatorium opened its doors on the shore of Kapiolani Park. And then in 1954 the Waikiki Shell concert venue began hosting live performances! Just because it’s relaxing doesn’t mean there’s nothing to do at Kapiolani Park. Sure, you can stretch out in the shade. But the park is also an ideal place for you to jog, exercise, practice yoga, etc. 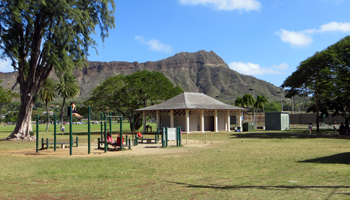 Additionally, on any given day, Kapiolani Park is used to play tennis, basketball, baseball, soccer, rugby, cricket, and lacrosse. Sometimes these are “pick-up games” that you could join if you feel inclined. Other times, you could literally pull up a sideline seat at a rugby or lacrosse tournament! How’s that for free Hawaii fun activities?! And speaking of free Waikiki entertainment, the Royal Hawaiian Band performs a free concert on many Sunday afternoons at the park’s bandstand. 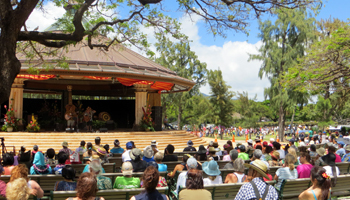 Additionally, the park plays home to numerous events throughout the year: including cultural fairs, exhibitions, Lei Day (and other such festivals), fun runs, the Honolulu Marathon start/finish line, and more! Many of these events feature unique local foods and crafts for sale plus free Waikiki entertainment. But even if you’re there on a somewhat rare weekend with no scheduled events, you can still stroll along Monsarrat Avenue and check out Art on the Zoo Fence – an actual art show hosted every Saturday and Sunday from 9am to 4pm (since 1953) by the Zoo Fence Artists non-profit organization. Meet local artists and check out their original works and prints. If you see something you like, try to negotiate a price. I, personally, have found that framed artwork is one of the best ways to give yourself a daily reminder of your Hawaii vacation fun.